Am I the only person amazed that people care more about clothes than play? I managed to play on clay for more than 40 years with tennis rackets, which I now learn were not designed for that purpose. I must be very talented. I don't care about the clothing, unless it's something horrendous that causes nightmares. The pink and black Nike outfits... and Serenas cat suit fit the bill. I think a $300 million contract is worth discussing. Shallow and deep people may join the discussion at some point. Let’s agree to disagree I don’t see any reason why on a tennis forum should be discussed pecuniary details of business decitions made by players. Depends if ATP or WTA. Not overly concerned with ATP but WTA notice more. Wimbledon is bad time for clothing everything is now white looks like bargain bin cheap store items. Lacks class or ability to look classy. There are some eye sore looks which I notice but otherwise no. Thanks for making me realize that I was not playing tennis. Better late than never. I will build my own grass court and try to recover all this time lost. More options, I could now buy RF gears without RF logo. No, those shortcuts won’t make it. Once I realized the seriousness of my mistake, I am shooting for the most real tennis experience that anyone may have. Great, as long as they don't add someone's initial for us to wear. Love the qualiy of Nike tennis products! I could not care less what company is making Fed's clothes or the clothes of any other player. But I swear I read more today about Uniqlo or whatever the new company is than about who won and lost at Wimbledon. You don't care for tennis and clothes, but do you care for the two independently? That's the difference between Nike and Uni Qlo. Nike may have some things for the gym but if you aren't some teenage kid in tracks and a hoodie, there isn't much else to think about it. With Uni Qlo it would be nearer to shopping for general fashion. Your office, your dates, your kids, the occasional times you look at yourself in the mirror and wonder where have things all gone wrong. Do you enjoy putting effort into your clothes? But are their kits from Nike or Uniqlo, though? *That* was the info. Nope. Never gave a damn about clothes, still don't. That's not to say that I prefer to look slovenly. But a comfortable pair of shoes, a couple pair of jeans and comfortable, informal shirts is what I wear around 99% of the time. I have not worn a "monkey suit" in years. That said, after having glanced at a few UNIQLO shirts, I'd be more inclined to buy them than Nike because to me the prices seem more reasonable! That said, after having glanced at a few UNIQLO shirts, I'd be more inclined to buy them than Nike because to me the prices seems reasonable! The nice part about Uni Qlo is they're into smart-casual. This might mean anything. Office, beach, safaris, lazing around in your bathrobe having toast with the dog barking at strangers. Basically, someone exactly like you. You want to look presentable but don't want to make the effort. And you definitely don't want to spend money because 90% of the time you'll never wear what you buy anyway as you slip into whatever you're already comfortable in. Its a win-win for Federer, tennis and all of us. That's why this seems meaningful. How is it you know just enough Japanese? Badges/squares can make for some timeless logos. Who would have ever imagined an aircraft propeller would end up being so recognizable? Meaty BMW badge or svelte Mercedes tristar? Because I was fascinated with characters, but in Japanese you also have to learn both hiragana and katakana. I think it's the hardest language on the planet. I was starting to get somewhere, but my "language partner" in Japan lost interest, and it was too lonely working all by myself. I got to the point where I knew hiragana really well, but katakana was always harder for me because it is generally used for foreign words or advertising. I know just enough to embarrass myself! What I find most amusing is people on this forum, most of which have / will never negotiate a contract in a life, second guessing teams of highly paid lawyers at Nike, Uniqlo and Team Fed. And then throwing words like "brand loyalty" in what is a pure business decision. Also, I've got to say that the timing of this is brilliant, judging by the enormous reaction and coverage. They've probably put ink to paper days or weeks ago, but then Fed went to play in Nike gear in Stuttgart and Halle, to preserve the announcement until the biggest tournament in the world, for maximum exposure. Different tastes I suppose, personally I couldn't care less, though there are a few people at my local club who are obsessed with what players wear and can remember all sorts of outfits and shoes from Federer over the years. I can only remember certain classics like Darth Fed or his early 05 gear. It definitiely helps is you’re coming off character based languages, Chinese or Korean perhaps. If you’re used to alphabets it’s tricky. The nice part is character driven languages do have a simpler approach to grammar than we’re used to in English or god help you, German. One that is absolute gibberish to me, and I’m told is astonishingly difficult, is Balinese/Indonesian. Seems to me even if you spoke Japanese perfectly you’re always going to find some way to embarrass yourself anyway in Japan. So many societal rules. If anything Nike failed not making the best use of Fed as a global icon. Clearly he’s stylish, enjoys dressing well and being in the spotlight. Nike seemed to care keeping it confined to the niche arena of tennis. That’s their business model, who could fault them? All three; Nike, Uni Qlo and Federer are extremely successful brands. Just happens Uni Qlo and Federer have more in synergy so that’s the way the cookie crumbles. German is tough, but also very logical. It is the easiest language for me to read in other than English. It's also very phonetic. p.s I have been wearing Nike running shoes since 1982 (when Fedr was 6 months old!!!) LOL. I am told Tomic threatened to leave Nike if they didn't dump Fedr. I choose shoes for one reason and one reason only: they have to be comfortable for running. I would buy "Uncle Joe's Shoes" if they fit and allowed me to move without discomfort. The name means nothing to me. Asics are best for my feet. When my shoes are not right, I become lame. When they are right, I can run freely. Okay, can now better understand. If you’re comfortable with English/German phonetics it’s like washing your brain inside out to pick up the phonetics of Japanese/Chinese. These things drove me insane the first year in China. What the hell are you supposed to do when you see B and a picture of a pineapple? Heck, the chart isn’t even in any discernible order. If you’re starting from a different base you’ll never learn anything completely new. I need your source. I have some questions that nobody wants to answer. Why does mainland China charge import duty on goods made in Taiwan if it’s the same country? We care everything about Fed. Something similar could happen to Northern Ireland post-Brexit. The craziest enclave I’ve read of is the Indian district of Dahala Khagrabari. Some part of India is inside Bangladesh which is inside India which is inside Bangladesh. Here’s a helpful map if that sentence gave you an instant strabismus. Forget about import duty. Just getting a letter in there is next to impossible. Just sounds to me like that snake eating it;s own tail. 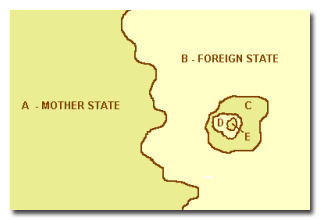 If i am not mistaken, B'desh is surrounded by India on 3 sides, and the Indian Ocean below. Never heard of this place, must look it up someday. I got it from my old friend Rusty Shackleford. He's not around much, so you can approach Bartelby for an answer. He knows it all. I’d ask Bartelby but he’d find some way of pointing at my misogyny and make me write sentences on being a better human. Much better I ask @stringertom - with him all I’d need is an aspirin. For tennis related stuff, there's Tom. For directions to the nearest AYCE, you already know. Why does this surprise you? People also care more about their guy winning than the actual play. You aren't writing these things on a Commodore 64 [I'm hoping]? Perhaps its time to burn those shoes at the stake too. BTW eye youse Advil knot assburns four pane. Lemaire does a collection for Uniqlo called Uniqlo-U and his 'atelier' designs Federer's outfits. Uniqlo also does J.W. Anderson, so when it comes to serious fashion Nike can't compete. Hahaha starting to quite like that animal it is cute. Wonder what a baby from that animal and with a goat (mother of course) would look like. Two phund there innvashun phorces win Covfefe45 ohkays taikover four hiz frinz inn Bayjing??? If you don’t care about it then don’t pay attention to it. Oh that would be too easy.. Clothes are important because most people lose all credibility when naked.